Blazing along its path to Pluto, NASA's New Horizons has come within hailing distance of Jupiter. The first picture of the giant planet from the spacecraft's Long Range Reconnaissance Imager (LORRI), taken Sept. 4, is a tantalizing promise of what's to come when New Horizons flies through the Jupiter system early next year. New Horizons was still 291 million kilometers (nearly 181 million miles) away from Jupiter when LORRI took the photo. As New Horizons comes much closer, next January and February, LORRI will take more-detailed images. "These first LORRI images of Jupiter are awe-inspiring," says New Horizons Project Scientist Hal Weaver, of the Johns Hopkins University Applied Physics Laboratory (APL), where LORRI was designed and built. "New Horizons is speeding toward this majestic planet at 45,000 miles per hour, right on target for a close encounter on February 28 of next year. LORRI's resolution at Jupiter will be 125 times better than now, and we're really looking forward to getting the most detailed views of the Jovian system since Cassini's flyby in late 2000 and Galileo's final images in 2003." LORRI snapped this image during a test sequence to help prepare for the Jupiter encounter observations. 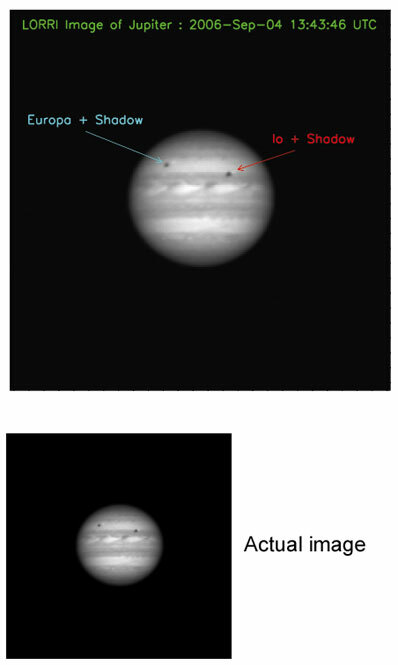 It was taken close to solar opposition, meaning that the Sun was almost directly behind the camera when it spied Jupiter. This makes Jupiter appear blindingly bright, about 40 times brighter than Pluto will be for LORRI's primary observations when New Horizons encounters the Pluto system in 2015. To avoid saturation, the camera's exposure time was kept to 6 milliseconds. This image was, in part, a test to see how well LORRI would operate with such a short exposure time. "LORRI's first Jupiter image is all we could have expected," says LORRI Principal Investigator Andy Cheng, of APL. "We see belts, zones and large storms in Jupiter's atmosphere. We see the Jovian moons Io and Europa, as well as the shadows they cast on Jupiter. It is most gratifying to detect these moons against the glare from Jupiter." LORRI wasn't the only New Horizons instrument peeking at Jupiter on Sept. 4; the Ralph imager also performed some important calibrations. "We rapidly scanned Ralph's Multispectral Visible Imaging Camera [MVIC] across Jupiter to test a technique we plan to employ near closest approach next February. We also observed Jupiter in the infrared using Ralph's Linear Etalon Imaging Spectral Array [LEISA]," says Ralph Program Manager Cathy Olkin, of the Southwest Research Institute. "Everything worked great." New Horizons won't observe Jupiter again until early January 2007, when periodic monitoring will begin, followed by intensive observations at the end of February. The spacecraft will also continue to look at the Jovian magnetosphere for several months after closest approach. "New Horizons is headed to a spectacular science encounter with the Jupiter system early next year," says mission Principal Investigator Alan Stern, of the Southwest Research Institute. "The first LORRI images of Jupiter just whet our appetite for the observations to come." New Horizons, the first spacecraft to Pluto and the distant Kuiper Belt region, launched on Jan. 19, 2006. Stern leads the mission and science team as principal investigator. APL manages the mission for NASA's Science Mission Directorate and is operating the spacecraft in flight. The Applied Physics Laboratory, a not for profit division of The Johns Hopkins University, conducts research and development primarily for national security and for nondefense projects of national and global significance.